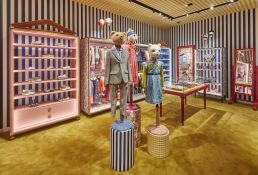 Gucci has announced the re-opening of its newly renovated store in Chadstone Shopping Centre, Melbourne. The store boasts over 4,305 square feet to showcase the complete collection of men’s, women’s and children’s ready-to-wear, handbags, luggage, shoes, jewellery, watches and accessories. With a look that invites customers to feel welcome and relaxed, the interior design is discreet. Soft elements like velvet walls offset harder surfaces and industrial elements. Contemporary luxury is suggested not only by the employment of the beautiful herringbone parquet and optical marble carpet, but also through a determinedly spare use of space. 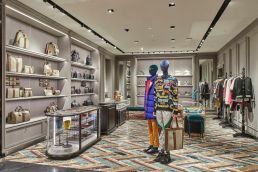 In keeping with the elegant and contemporary eclecticism that characterizes Gucci’s new collections, the store sees the combination of traditional and modern, industrial and romantic. 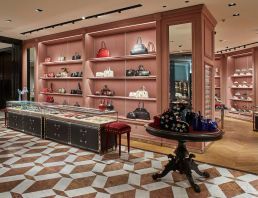 The concept complements the House’s product offering, including the highly anticipated Gucci Cruise 2019 collection, which will be one of the first available in the new space. Contrasting merchandising elements represent different design codes, combining to create curiosity, inviting customers to feel like they are constantly discovering new aspects of the store. 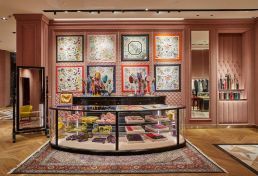 This journey is mirrored in the fact that travel is a central theme of the new store design, referencing the history of the House, specifically through the use of the aesthetic codes of luggage – and the trunk in particular – to create decorative elements. The mood within the store is one of discretion, where understated drama is created by the surprising and unexpected combination of materials. Marble polychrome inlays produce decorative three-dimensional effects on the floors, overlaid by vintage oriental rugs that are layered over each other for a textured effect. Juxtaposition of this sort, where opposites forge a new connection, is repeated throughout: technical, mechanical display units contrast with the softness of the rich fabrics that adorn the rooms; metal plates with a burnished geometric pattern sit alongside round tables offset by rectangular ones; varnished iron wall finishes complement the marble carpet and red or dusty rose pink velvets, used for upholstery of the walls and fixtures. The result is a space that entices, surprises and feels personal to Gucci.